Lent is here and we are preparing for the upcoming Easter. This year our church is promoting small group meetings. The purpose of the meetings is to discuss our faith and remind us why we practice the way we do. I am participating every Wednesday night. I really enjoy the other four women in my group. We made a plan to be more "present" this week in how we worship. I think being "present" is something I often take for granted. I might be somewhere or participating in something, but am I really "present"? Often, I'm probably just going through the motions. Since Wednesday, I've been trying to be a lot more aware while doing everything. Not just at church. Not just in prayer. But in EVERYTHING. On Thursday instead of staying home to catch up on housework during the boys' baseball practices, I went along too. The weather was beautiful and it was so much fun watching the boys with their new teams. And, in church today I was more aware of the readings and my responses. I heard every word of the songs and really thought about what they were saying. I sat between my two boys and enjoyed seeing them participate as well. I have to admit though, all this being present has pushed my scrapbooking to the backseat a bit. That and NCAA basketball! My evenings have been a bit occupied while I watch games with my guys. I did manage to finish one layout recently. This layout is an assignment for Crop Chocolate. I used the new Echo Park "For the Record" paper line. I just added a set of Thickers for my title. 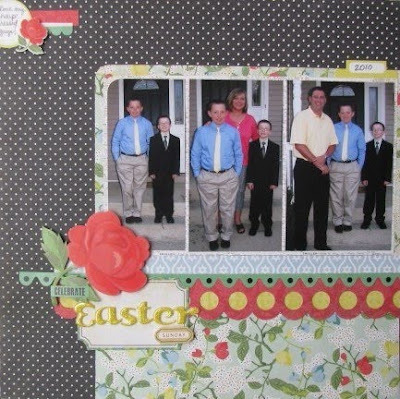 I thought it was fitting to include an Easter layout in this post. I love celebrating Easter with my family. Back to scrapping...I also love all the journaling and accent stickers that come with the Echo Park paper lines. With the new week starting, I hope you all take some time to be present. I am also trying to enjoy the journey of life this year. It is all about the process not the goal. We call our small group a cell group and they are the people that are always there for us...such a wonderful blessing. Your group meetings sound wonderful. Being PRESENT is SO important because too often we are focused on things that seem to matter but really don't.